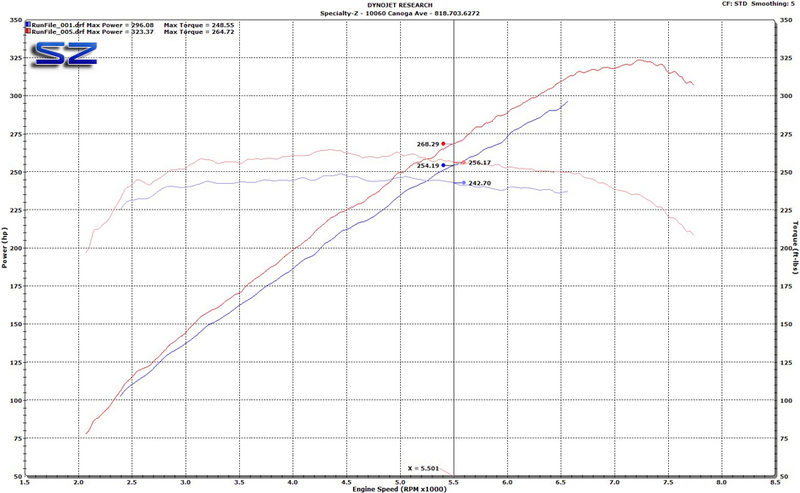 Tyler came back to us after having us tune his Z31 track car. This time he brought us his newly acquired S14 with a built turbocharged VQ35DE. This car was built with a purpose and made to hit the drift circuits and road courses. The turbo portion of this car comes from the old 350Z\G35 Turbonetics Kit. 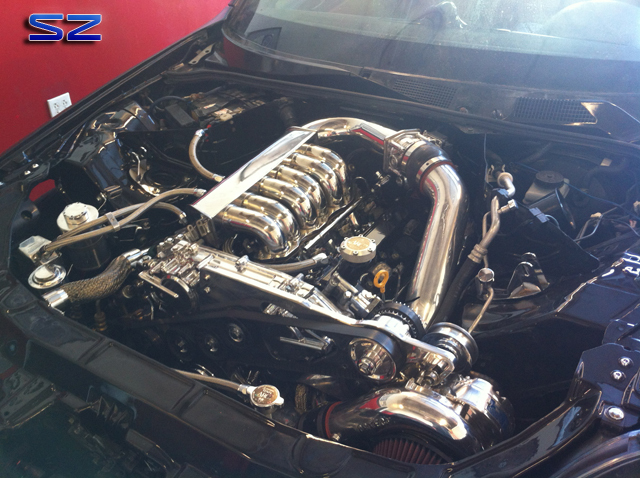 A custom intake manifold was made with top end power in mind. Controlling this moniacal setup is an AEM Standalone. We reached the limits of both the fuel injectors and fuel pump so we did what we could with what we had to work with. We also found ourselves performing some wiring fixes before we tuned to get the car to run properly. For a test we removed that terrible intake on the front of the turbo. Here are some tuned results. 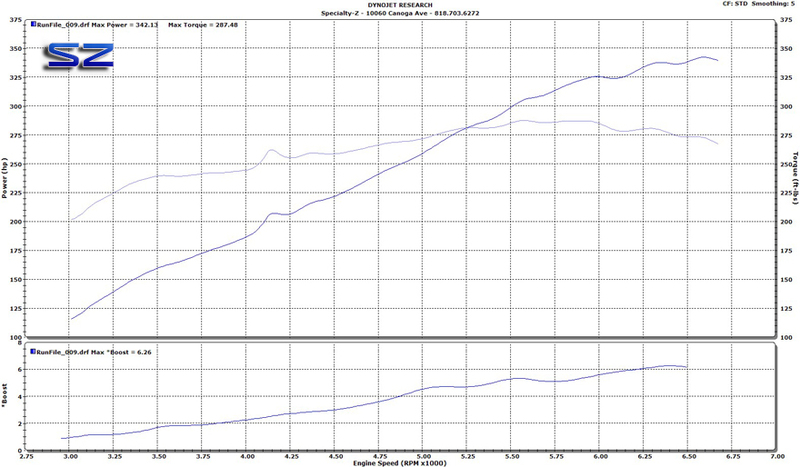 The red run was performed with that terrible intake I mentioned above. This is how the car will be running for now on the circuit. As it is the injectors and pump are on the raggedy edge. For a test we removed the terrible intake and made a pull. We changed NOTHING else. We came up with a great difference. Look at the boost curve! This poor turbo is working hard to make power with the terrible intake. For now it serves a basic function of a restriction. Vivek has one tricked out G35 sedan. I have no pictures of the exterior but it is one cool show car. This sedan is running a Vortech blower with all the trimmings. 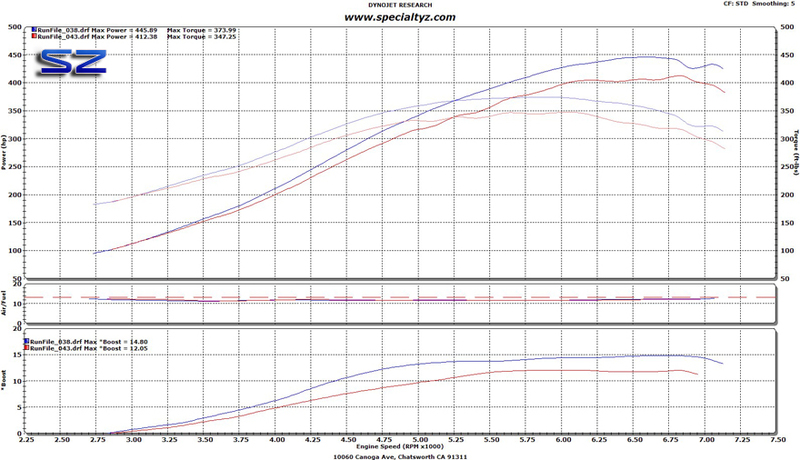 Running a stock engine and base pulley size we were able to make 6 psi of boost and tune his ride for max reliability and power. Steve brought us his 370Z for some tuning. We were impressed with the results needless to say. Click on the graph to see it in its entirety.